Since we all know how excited I am about this whole local happy beef thing, I thought I would give you a quick update. After purchasing our freezer, we let the farmer know we were ready to place our meat order. They are still ironing out dates as to when the beef will be ready so we don't have an estimated time of arrival yet. But I'm hoping it's soon! 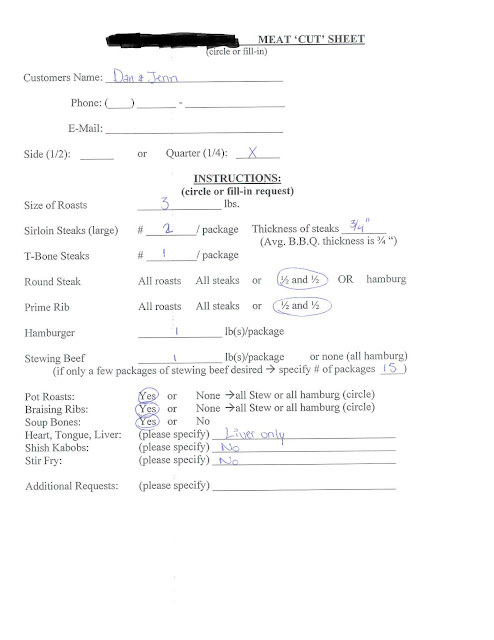 Our next step towards filling our freezer with some homegrown grass-fed beef was to fill out the "cut" sheet. This is what our order looks like. Just to give you an idea of how much meat we are getting, the farmer said to expect approximately 125lbs of beef. Woohoo!!! We will be set for a good year. So that's our newest update for those who are interested. I will keep you informed along the way. Casey, I have a bit of an advantage since I did grow up on a farm. But then again, I was also a little overwhelmed by this sheet and asked the farmer lots of questions. I wish we had something like that around here, I would be in heaven. I would love the idea of one less thing to worry about when going shopping. Have you tried searching online to see if there is anything similar that you can do where you are? I'm so jealous! We've been wanting to do this forever! We used to have one in our garage that we stored some deer and duck in from hunting season. But the breaker went out one day and we didn't realize it until DAYS later...so we're hesitant to even use it for fear the same thing will happen again! Katharine, that must have really sucked when the breaker went. Did you lose a lot of meat? I would totally be hesitant to use it again. Me - I will for sure be posting pictures of all the meat when we get it! I won't be able to contain my excitement, it will overflow onto the blog.